It is not that easy to find a good dinner place in Central/Eastern European cities I heard that it was not the custom for the local people to eat out at night. Therefore, most of the restaurants we find are for tourists. And, that looked to be the case in Krakow as well. But... we really wanted to try the local food if possible. 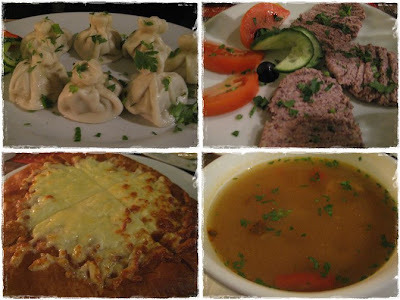 What we found out was that there weren't too many "pure" and "traditional" Polish food restaurants in Krakow. Most of them are fused with neo-"such and such", which sounds good but was rather disappointing to someone like me who doesn't want to see "Thai-style soup" in a Polish restaurant. Lots of restaurants also had Italian dishes like Pizza and Pasta. It was raining that night, and the restaurant was half empty when we walked in, but the ambience was good, and we got a table by the window. Georgia is a small country by the Black Sea, on the opposite coast from Romania. It neighbors Russia, Turkey, Armenia, and Azerbaijan. To be honest, I didn't know too much about Georgia except some of the coups that broke out back in the 90's and the recent sad accident of the luger at the winter Olympics. Just to explore basic Georgian food, we decided to order all four appetizers on the menu along with the Georgian wine; I found out later that the region around Georgia was the historical origin of the grape-based wine!! For wine, we ordered Mukuzani, which I just loved so much. It was the first time that I ever tasted Georgian wine, but I have to say it is superb (and cheap, too ^^)! As for the appetizers, these are what we tried. 1) Georgian dumplings called Khinkali. They looked more like Chinese dumplings than the Polish dumplings calle Pierogi which seem to be flatter. They serve you a whole bunch of them on one plate. It was one of my favorites, but it fills you up quite quickly. 2) Some kind of bean paste. It had a very healthy taste, but it was not one of my favorites. 3) Khachapuri with lots of cheese, which was my hubby's favorite. 4) Kharcho, traditional Georgian soup. It is a bouillon-based soup with sun-dried plum purée and grated walnuts. It has meat, rice, and finely chopped vegetables in it. I loved it! After happily stuffing ourselves with Georgian wine and food, we passed through the central square. It was late, but the square was still full of people enjoying the live band despite the rain. This town might never fall asleep!